Horses used in Ancient Egypt to pull chariots. Most studies suggest that domestication of the horse took place along the Eurasian steppe. However, it is not clear where exactly and most likely there were several independent domestication attempts. Interestingly, wild horses before domestication show a wide range of interspecies variation; however, it is believe that only one type of species became domesticated. Most likely, the horse was domesticated by 4000-3500 BC. All domesticate horses are classified as Equus ferus caballus, with Equius ferus as being the species that domesticated horses derive from. Initial domestication may have been done as a means to develop horses as traction animals, or use in agriculture and plowing, and also for riding. Probably at around the 3rd millennium BC, the horse began to spread across Eurasia and into China, Europe, and India. This could have been associated with the migration of Indo-European and Eurasian groups that were likely migrating across Asia during this time. These populations may have introduced horses, therefore, to new regions such as the Near East, India, and China. During the 3rd millennium BC, the utility of the horse for warfare is apparent and the association of horses for high status individuals is likely, as warriors of high standing were now sometimes buried along with their own horses. Horse skulls were also sometimes separated and buried separately, suggesting a type of cult around horses may have also developed. By the end of the 3rd millennium BC, the horse is referred to in ancient textual sources from the Near East. 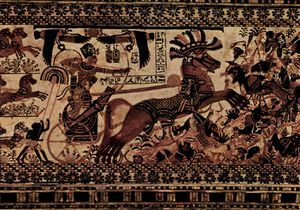 While the importance of the horse for warfare became evident in the ancient Near East by the early to mid second millennium BC, and likely earlier in the Eurasian steppes, another important turning point we see happen during the early 1st millennium BC. By this point, horseman were now the elite soldiers of militaries and horses became central to many armies, with charioteers now being replaced (Figure 1). The importance of the horse for military purposes is evident in the numerous ivories now found used to decorate horses. Horses were now also used for rapid messenger services, similar to the pony express later developed in the United States. Rapid messages sent between distant cities were important for communication within empires and militaries, starting with the Neo-Assyrian Empire but continuing with the Achaemenid Empire. By the late 1st millennium BC, from around 300 BC, we now see elite horseman utilized in West Asia, Europe, Central Asia, China, and India. The innovation of the stirrup most likely facilitated the spread of horseman and the removal of chariots from the battlefield, as it facilitated the control of horses by riders and also probably made horse handling more widespread. This probably includes more widespread use of the horse for transport as well. It is during the 1st millennium BC that horses became increasingly associated with royalty in Asia, in particular Western Asia, and then in Europe as well. The trend of horseman being among the most elite soldiers of militaries, in fact, persisted until the early 20th century AD, with the innovation of tank warfare. This makes the horse and horseman, in fact, one of the longest serving form of military tool used in armies. The roles of horses also increased as technologies further developed. In addition to warfare, horses in Europe and other locations began to replace oxen more substantially in agriculture in the Medieval period, although forms of this system existed already in ancient periods in the Near East by the 2nd millennium BC. In both Europe and the Near East, the use of padded harnesses enabled horses to more securely pull a plow, which facilitated horses to plow more area and regions and horses were now able to do this work far faster than oxen. Horses became more commonly used as well for transport, as training and utilization of horses improved with greater knowledge. We see that horses, which were first domesticated in Eurasia, began to spread rapidly soon afterwards in the 3rd millennium BC. Horses and their roles included agricultural work, as pack animals, and as instruments of war. By the mid-2nd millennium BC, horses begin to have an even more dominant role in large-scale, complex society warfare. 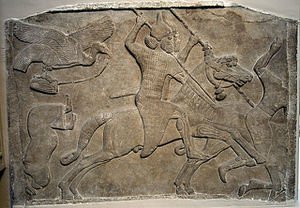 In the early 1st millennium BC, elite soldiers and horsemen replaced charioteers and became the elite soldiers of the battlefield until the early 20th century AD, even after innovations such as gunpowder and rifles. Key innovations such as the stirrup and harness facilitated the dominance of horses as beasts of burden and warfare. ↑ For more information regarding the debate of horse domestication, see: Olsen, Sandra. 2006. “Early domestication on the Eurasian Steppe,” In: Documenting Domestication: New Genetic and Archaeological Paradigms, Melinda Zeder (Ed.). Berkeley, Calif: University of California Press, pg. 245-269. ↑ For more information on the species of horses, including how a single species became domesticated, and their genetics, see: Weinstock, Jaco, Eske Willerslev, Andrei Sher, Wenfei Tong, Simon Y.W Ho, Dan Rubenstein, John Storer, et al. 2005. “Evolution, Systematics, and Phylogeography of Pleistocene Horses in the New World: A Molecular Perspective.” Edited by David Hillis. PLoS Biology 3 (8): e241. dos:10.1371/journal.pbio.0030241. ↑ For more information for the early domestication of the horse, see: Mills, D. S., and Sue M. McDonnell, eds. 2005. 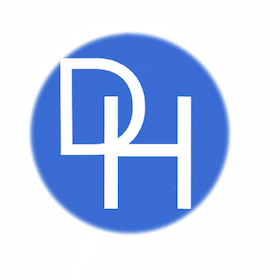 The Domestic Horse: The Origins, Developments, and Management of Its Behavior. Cambridge, UK ; New York: Cambridge University Press, pg. 7. ↑ For more information on burial of horses and cults around horses, see: Drews, Robert. 2004. Early Riders: The Beginnings of Mounted Warfare in Asia and Europe. New York: Routledge. ↑ For information on some of the earliest historical references to horses, see: Postgate, JN. 1986. “The Equids of Sumer, Again,” In: Equids in the Ancient World, Meadow RH, Ueopmann H-P (Eds.). Dr. Ludwig Reichert Verlag: Weisbaden, pg. 194-206. ↑ For information on the trade of horses from the Amarna letters, see: Morkot, Robert, and Robert Morkot. 2010. The A to Z of Ancient Egyptian Warfare. Lanham: Scarecrow Press, pg. 107. ↑ For more information on how horses were used and spread in the ancient Near East, see: Orlin, Louis L. 2007. Life and Thought in the Ancient Near East. Ann Arbor: University of Michigan Press, pg. 82. ↑ For information on war horses and chariots, see: Eglan, Jared. 2015. Beasts of War: The Militarization of Animals. JEG Publishing, pg. 47. ↑ For more on the importance of elite horseman in the early 1st millennium BC, see: Dezső, Tamás. 2012. The Assyrian Army. 1 1: The Structure of the Neo-Assyrian Army as Reconstructed from the Assyrian Palace Reliefs and Cuneiform Sources Infantry. Antiqua et Orientalia 2. Budapest: Eötvös Univ. Pr. ↑ For information on the utilization of horses for early 1st millennium BC messengers, see: Silverstein, Adam J. 2010. Postal Systems in the Pre-Modern Islamic World. Cambridge: Cambridge Univ Press, pg. 12. ↑ For more information about the stirrup and its innovation for horses, see: Chamberlin, J. Edward. 2006. Horse: How the Horse Has Shaped Civilizations. New York: BlueBridge, pg. 80. ↑ For information on how horses improved Medieval agriculture, see: Zmolek, Michael Andrew. 2013. Rethinking the Industrial Revolution: Five Centuries of Transition from Agrarian to Industrial Capitalism in England. Historical Materialism Book Series, volume 49. Leiden ; Boston: Brill.